Adaptive reuse is an architectural term that refers to taking a building that was purpose built for one activity and altering it so that it can have a second life with another use. Generally, the most well known projects take a building with a very distinct first use and convert it into something completely different, such as an industrial age factory converted into loft housing. Victoria does have a couple of dramatic examples, however with most of them it would never be imagined that the building had previous life with a different use. When you are walking around Old Town Victoria you are surrounded by adaptive reuse in its most literal definition. Many of the old buildings, especially those closer to the harbour, were built as warehousing for holding the merchandise to be shipped overseas. Other buildings now used as condos and apartments were originally built as hotels or office buildings. These conversions in many cases happened decades ago and have had most of their existence with a use other than the one they were originally built for. What I want to look at today are a couple of my favourite examples of adaptive reuse and a couple of upcoming or potential sites that could really catalyse an area. Perhaps the most famous and identifiable example of adaptive reuse in Victoria is the Canoe Brewpub. Originally built as the City Lights building in 1894. This was a coal power plant to generate power for about 100 street lamps (obviously efficiency has improved in the last 120 years). You can actually still see a lot of the City Light manhole covers around downtown too. In the 1990’s when there was very little construction activity going on in the city, some brave person decided to convert a then dilapidated building into a brand new brewpub and restaurant and spend millions of dollars doing it. 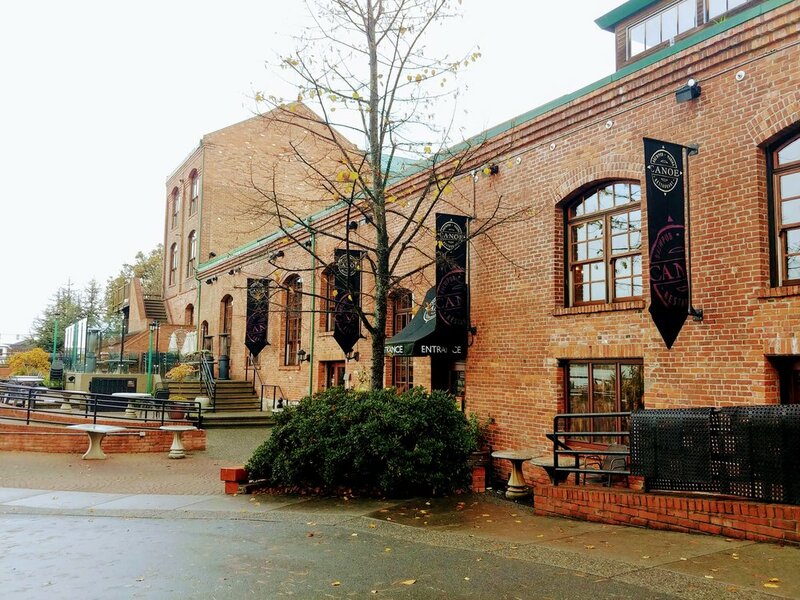 In the intervening twenty years since it was completed, the Canoe Brewpub has become a Victoria staple for food, beer and music. Going in the building now there is little evidence of the industrial history of the building, but it certainly is a beautiful space. Another well known example is a less dramatic transition in some ways. The Mosaic building on Fort Street started off its life in 1963 as the Royal Trust Building. It was designed by John Di Castri, one of the more prolific mid-century architects in the city. The front facade has huge mosaics by Andreas Salgo. When I first moved to Victoria in the mid-1990’s the building was mostly vacant and considered by many to be a tacky old office building. Luckily, developer Don Charity came along and saw that the building could be re-imagined. 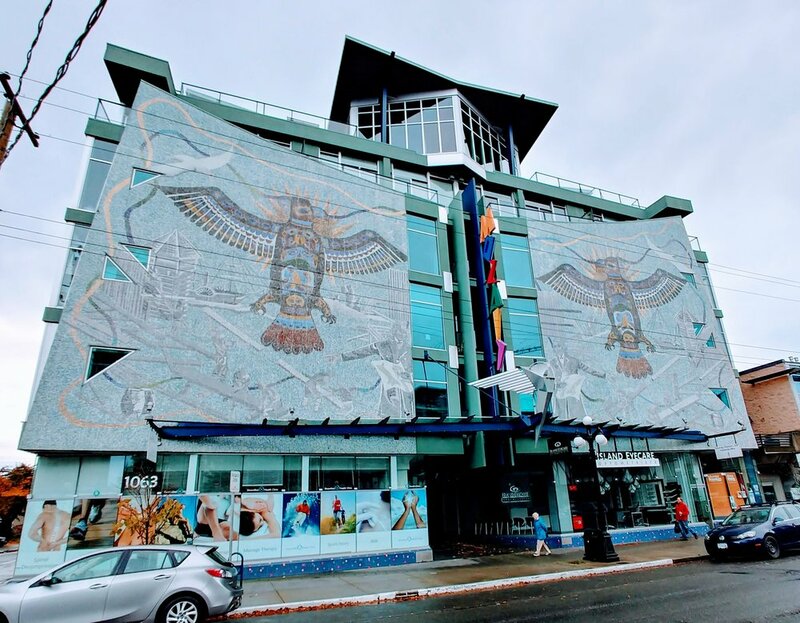 In 1999, the completed and renamed Mosaic building welcomed its new residents and Victorians now saw what was a tired old office building in a new funky light. Near the Mosaic is Pluto’s Diner which may be an example of what may be the most common adaptive reuse in North America, the transition of a gas station into a restaurant. Pluto’s is perhaps most notable in that they took a fantastic example of Googie architecture and emphasised the kitschy-space theme to create a great little diner. There are very few examples in Victoria of this architectural genre with perhaps the biggest loss being Mayfair Lanes which was torn down a few years ago to make way for a store that never materialised. I am a huge fan of this style so I hope that we get to see Pluto’s for many decades to come. Moving from the current examples to hopeful new ones, the three I am most looking forward to are: the Roundhouse project, the Northern Junk buildings and the re-imagining of the Times Colonist building. 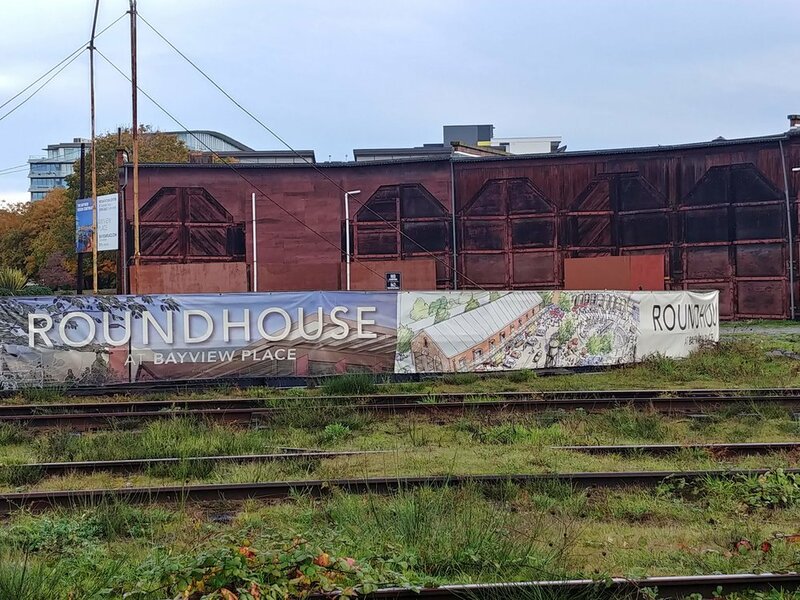 The Roundhouse redevelopment is part of the Bayview project in Vic West. With most of the buildings up on the hill above Songhees almost complete, the developer is moving to the next phase which will be in and around the rail yard and roundhouse buildings down near Spinnakers Pub. While the use has not been entirely lined up yet, there has been discussion of a supermarket, museum or community centre. No doubt whatever ends up going in here will be imbued by the very distinct space of the roundhouse. Another hoped for example of adaptive reuse are the Northern Junk buildings. This project has been in its infant stages for the better part of seven years at this point. These two buildings sit just to the south of the Johnson Street bridge and while they are not the most glamorous old buildings, they are very unique. First off the buildings are some of the oldest remaining warehouse buildings in Victoria and second it is thought that the buildings’ chaotic rock walls are composed from the remnants of ballast brought over on ships that were loading their holds in the early days of the city. Reliance Properties, the developer behind the project, would like to turn them into harbour side restaurants. In the last couple of months the Times Colonist building went quiet as its printers were turned off for the last time. The newspaper had outsourced its printing and the building itself had been sold with the goal of redevelopment. The plan is to keep the main building and lease some of the office space back to the newspaper, while turning the balance of the property into a mix of commercial and residential space. Some of the renderings I have seen for the commercial spaces look amazing with a large bar imagined for the former print room. A quality project in this location could actually be the spark that could start a new urban node for the city. There are many other buildings around the city that could certainly use the re-invigoration of adaptive reuse and perhaps the one that most people will bring up is the old BC Hydro building at the end of Pembroke and Store streets. This massive old building has been at the heart of a decades long clean up of the property, but to date no plans have come forward for it. Whatever it ends up being, the original building is already quite dramatic and I can imagine that a new use could emphasise the brick and the size in a similar way to the City Lights building has with Canoe. No matter what else is built on the old hydro lands, the original building will be the centre piece and depending on how well it is done will either be a catalyst or an anchor for the area. 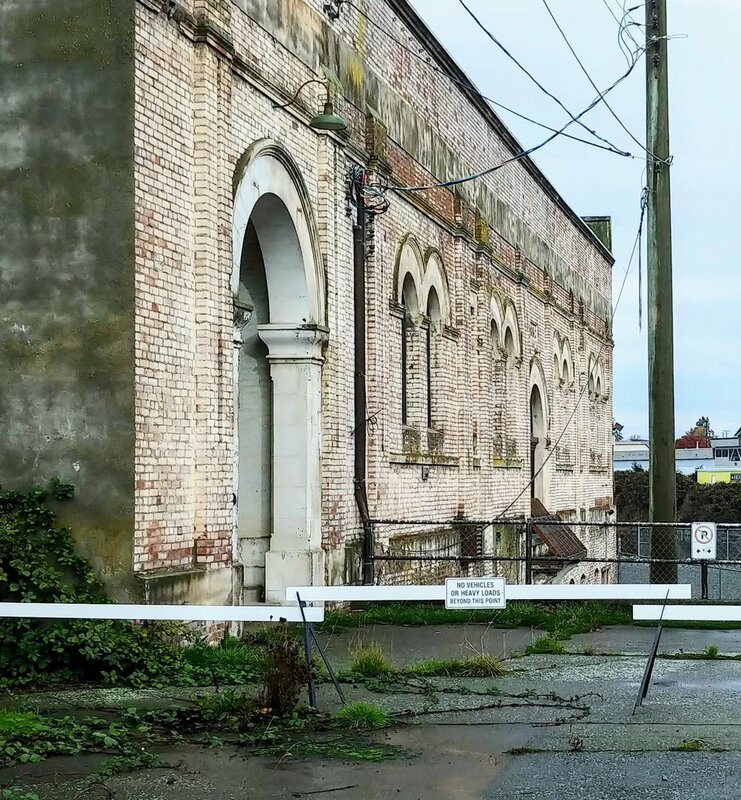 What are some of your favourite examples of adaptive reuse in Victoria? Even better do you have a building that you think could be so much better re-imagined with a new use?